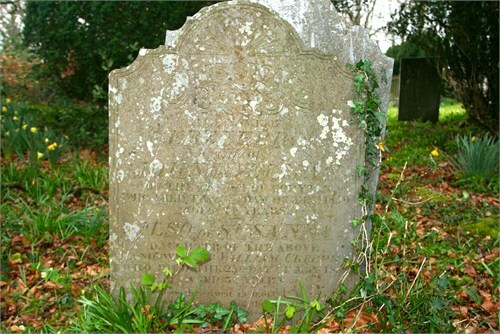 Why use name Ebzeebra for Ebbot Millman (nee Martin) on 1840 gravestone at Marystow, Devon, England? My 4th great grandmother Ebbot Martin was baptised on 7 Nov 1773 at Beaworthy, Devon, England. Ebbot married John Millman on 14 Sep 1795, also at Beaworthy. Susanna was baptised on 6 May 1798 at Northlew, Devon as the daughter of John Millman and Ibbott his Wife. Susanna was my 3rd great grandmother and married William Creber on 25 Dec 1820 at Marystow. Clearly, Ebbot's name was not easy for the recorders of the first six christenings, and it looks like their move to Sydenham Damerel resulted a new name being used for her. However, her name seemed to revert, to Ebbeat Millman of Coryton, for her burial record on 22 Dec 1840 at Marystow, Devon. Does anyone have an idea as to why such a name would have been chosen for her grave when it does not appear to have been recorded for her anywhere else? It may or may not be related but two of her granddaughters were named Hephzibah, presumably after her. Furthermore, Googling "ebzeebra" suggests Ebbot's gravestone name has been used for no one else on the web! I'm not sure this fully answers your question but I think it is relevant, and far too much to place in the comments. I'm not sure if you already have any or all of this, but I came across a second individual with a very similar name - Ebzebeda Millman (of course, the spelling varies). She was the daughter of William and Catherine Millman, born in Cornwall in 1821. William appears to have been the eldest son of John and Ebbot Millman, making this Ebzebeda the granddaughter of Ebbot/Ebzeebra. On the 1841 census, she appears as Edytha (see HO 107/134/10, ff 34-35, pp 13-14). 20 Mar 1843, Stoke Climsland, after banns: Charles Morgan, full age, bachelor, miner, of Oaks Wood in this Parish, s. of David Morgan, labourer, married Ebzebeda Millman, full age, of Oaks Wood in this Parish, spinster, work woman, d. of William Millman, labourer. Witnessed by William Millman (X) and James Hawton. On the 1851 census, she appears as Elizabeth Morgan (see HO 107/1899, f 616, p 30). On the 1861 census, she again appears as Elizabeth Morgan (see RG 9/1521, f 71, p 15). The spelling on the censuses could simply be a mistake during the process of filling in or copying the census forms, it does not necessarily mean she was known as Elizabeth. On the 1871 census, she appears as Hebzebbeda Morgan (see RG 10/2145, f 79, p 39). On the 1881 census, she appears as Ebzibeada Morgan (see RG 11/2217, f 6, p 5). All this is to say that there seems a lot of plasticity in the spelling of this granddaughter's name as well. I think the above is evidence that the spelling Ebzeebra is probably related to the name Hephzibah, though whether it was actually intended to be that name, or it morphed into that name, is impossible to say. Although it seems backwards, the spelling "Ebzeebra" on the gravestone may be derived from the above granddaughter's name. Perhaps her son William, being the eldest, was involved in the funeral and burial arrangements, and maybe he was the one who attempted to spell his mother's name. William appears to have been a witness to his daughter's wedding, and he signed the register with an X, indicating he was probably illiterate. This is nothing more than speculation, but it would be very difficult to prove. I have a similar (but less dramatic) case of an ancestor who on her baptism is called Edy, on marriage she is Edith, later in life she is sometimes Editha or Ada. Hephziba Millman was my 2nd great grandmother. I have found her with many given name variations, including some of those above. Illiteracy and the unusual name if spoken unclearly are, as suggested above, probably the reason for the variations. Out of interest I searched the web for "Hephziba". One result said that according to the Old Testament, 2 Kings 21:1, Hephzibah was the wife of the godly king Hezekiah, and literally translated from the Hebrew means "My delight is in her". Perhaps, if they were religious, this was her family expressing their feelings towards her. Not the answer you're looking for? Browse other questions tagged 19th-century england vital-records grave-marker devon or ask your own question. Identifying parents of John & William Milman who were baptised 1800 & 1805 at Okehampton, Devon, England? Wife's surname used as second name to indicate Smyth child named after someone from her Osment family? Were James Smyth Stacy and family in London, Devon or elsewhere for 1841 Census? Relocating christening record for Margaret Morgan, believed to be 1808 at St James, Bristol, England? What parish records are likely for pregnant widow with 8 children in 1791 at Whitchurch, Devon, England? Finding baptism record near Marystow, Devon, for Harriet Palmer in about 1770? Determining which Blanch Hambly married John Geach at Menheniot, Cornwall, England, in 1688? Interpreting 1801 Settlement Examination from Marystow, Devon, England? What type of journey from Plymouth to Exeter in 1751 might cost 1 pound 5 shillings?